Offline software for removing DTC in ECU files for VAG and PSA (Bosch ECU). Also those programs help to disable EGR and DPF. 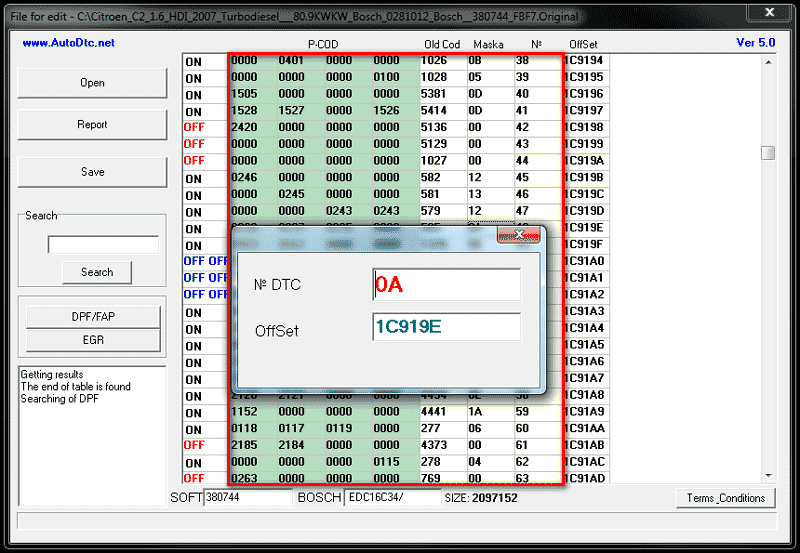 Use those DTC removers to find all diagnostic trouble codes in ecu files. 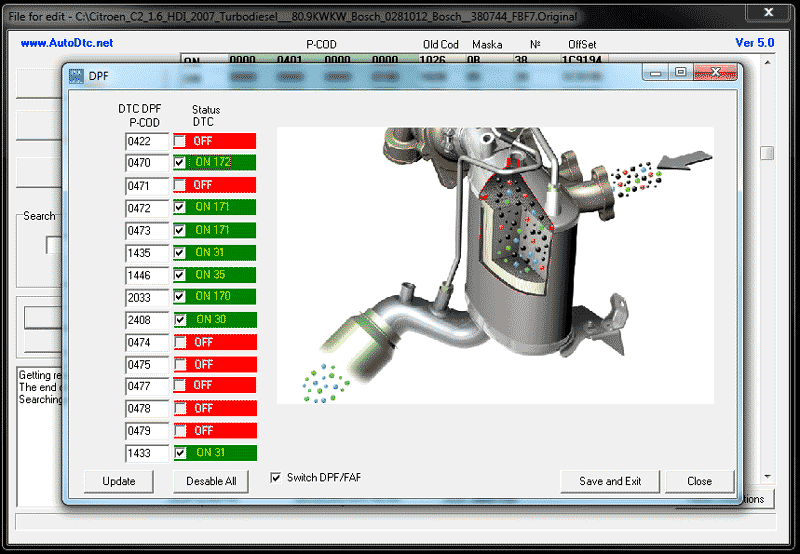 Programs show if DPF is ON or OFF as well as EGR. Select parameters for remove and save edited file offline. Programs work offline – without connecting to internet. 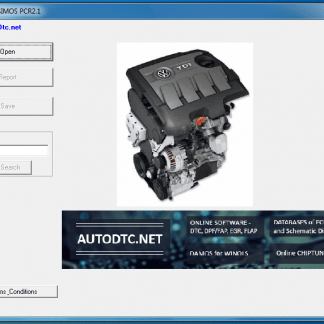 EGR, DPF and DTC removal software is very easy to use. 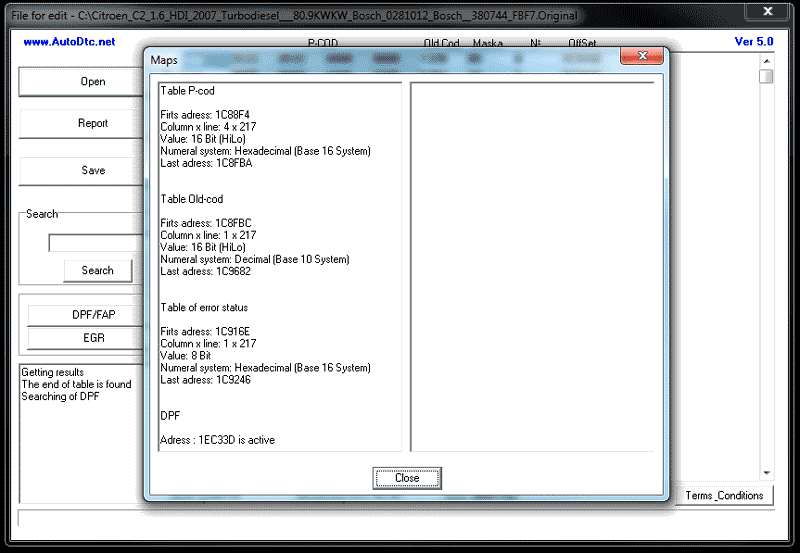 A client loads ECU file into program, selects parameters for removing and saves modified file in a local directory. You’ll know addresses of tables with P-CODE, OLD-CODE and table of error status. Load your file to make DTC off, DPF off and EGR off easy and quickly. Full description of each diagnostic trouble code: status, value and address in mask. 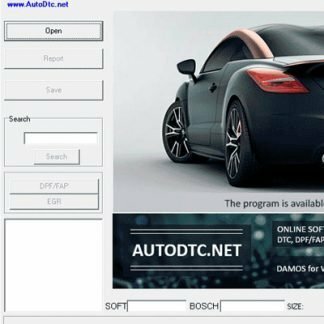 When you remove DPF / EGR the program delete all diagnostic trouble codes associated to DPF / EGR automatically.PSA removal software is developed specially for Peugeot and Citroen. 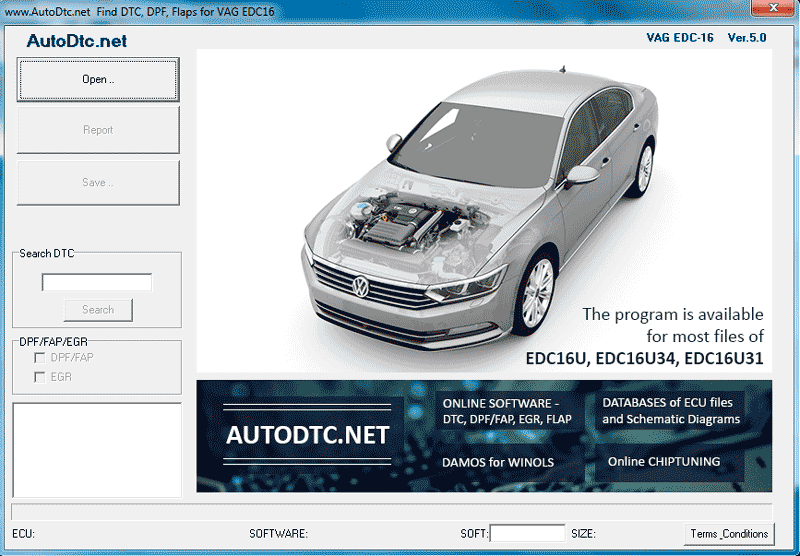 VAG removal software – for VW, Audi, Seat and Skoda. It helps to delete DTC, DPF and EGR on BOSCH ECU. Here are several screenshots of our programs with short descriptions. 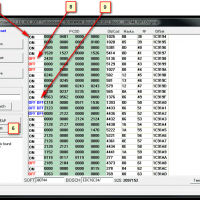 How to use EGR, DPF and DTC Removal software? (1) Use the button “Open” to open your file. (2) Use the button “Report” to get a short report. (3) Use the button “Save” to save modified file. 4) Enter diagnostic trouble code for searching in hexidecimal or in decimal representation (including “0”) and push the button “Search”. 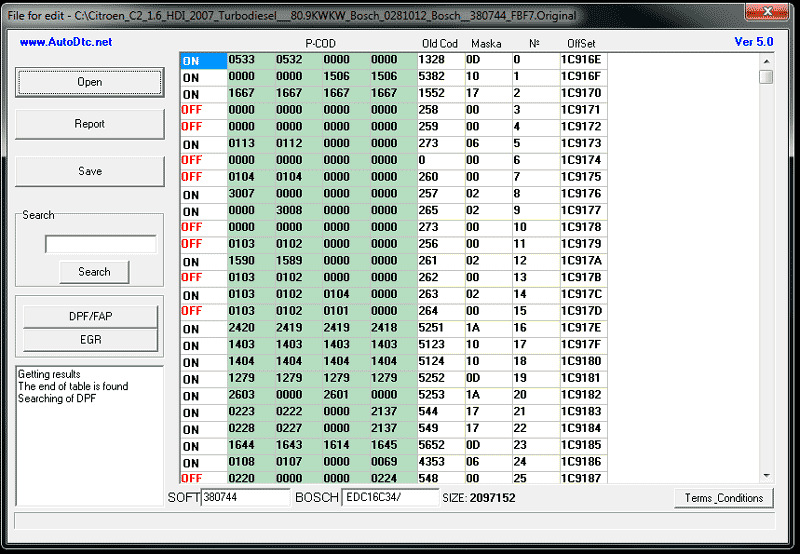 For example: 0571 in hex; 00381 in dec.
(5 – 6) “DPF/FAP” and “EGR” help you to remove these parameters in the file. (7 – 8) Status of DTC: on or off. (9) Do double click in the first column to select DTC for disabling. After this you’ll get label “OFF OFF” in the line with DTC for disabling. After double click on any DTC (error code) you will see address of this error in the file. 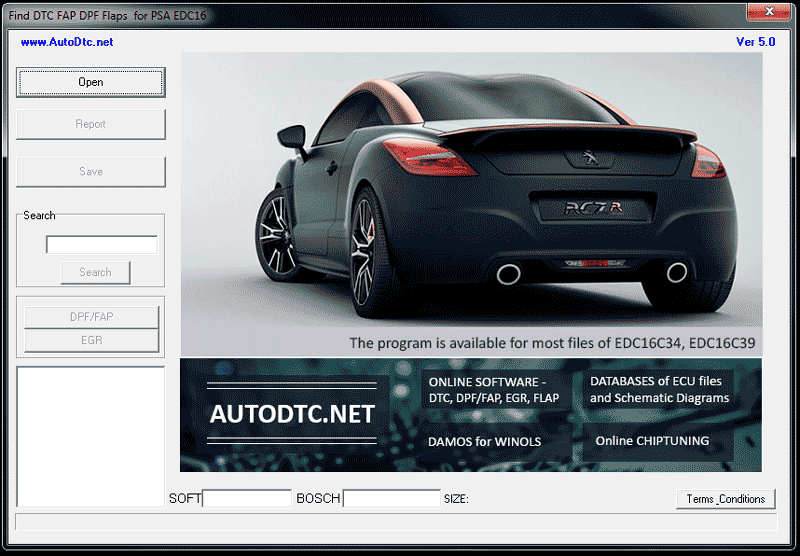 Special window in this ecu software helps you to delete DPF and all errors associated with it. Push the buttons “Disable all” and “Save and Exit” for automatically disabling DPF. You can use manualy settings. Use button “Disable All” for automatically disabling EGR in special window. 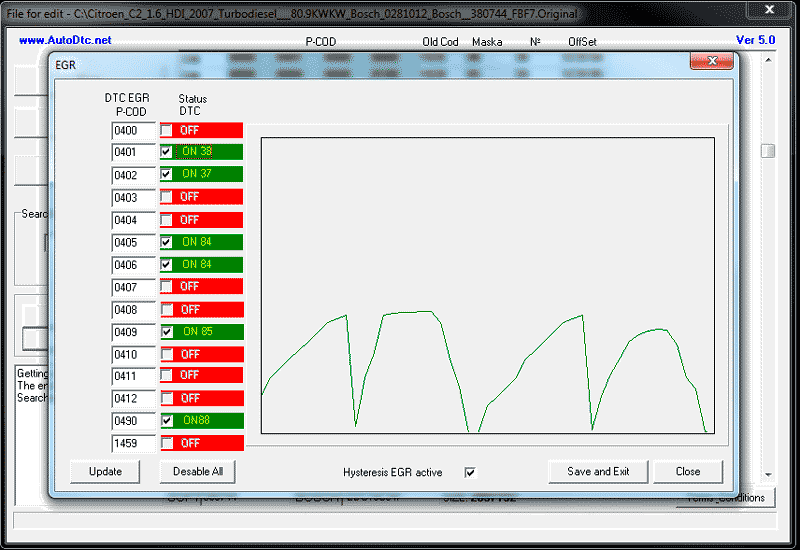 Settings for Hysteresis EGR you can change manually too. Here are videos “How to use” on Youtube. The first video is about program for VAG and the second is for PSA. 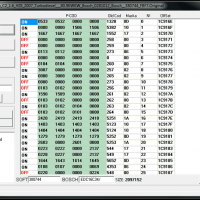 P-Code is in hexadecimal representation and consists of 4 symbols. VAG-Code may be in hexadecimal and decimal representation on your choose. 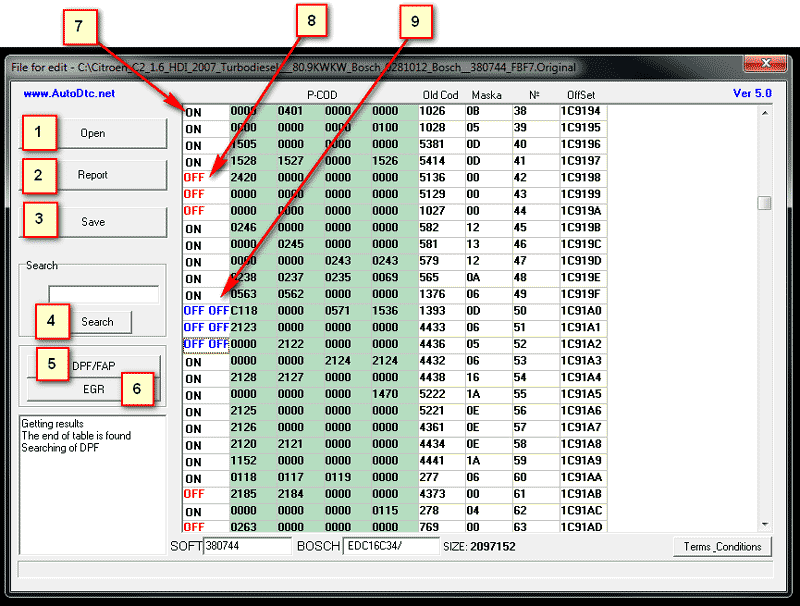 Hexadecimal representation of diagnostic trouble code for VAG consists of 4 symbols too. Decimal representation of DTC for VAG consists of 5 symbols. If you need delete DTC you should find it using field “Search DTC”. When you use form “Search DTC” you can search pcodes and vagcodes. Note: you should type full error. For example, “01A3” or “00125”. If you can’t select “DPF/FAP” it means that it’s already aborted.